At the risk of stating the obvious, businesses seek to make money and they won’t hire somebody who can only produce $6 of value per hour if the government says that person has to be paid $7.25. But there are those who nonetheless push for higher minimum wage requirements. I’ve previously provided six potential reasons why a person would support such a policy, three of which are because of cynicism and three of which are because of naiveté. I strongly suspect Obama and his team are pushing for a higher minimum wage for the first reason, but it’s hard to even care. All that really matters is that people will suffer if the President succeeds. And I’m not making a partisan point. Mitt Romney and George W. Bush had the same mentality. Now, perhaps, you understand why this issue is so frustrating. So let’s try to maintain our sanity by mocking these feckless and uncaring politicians. 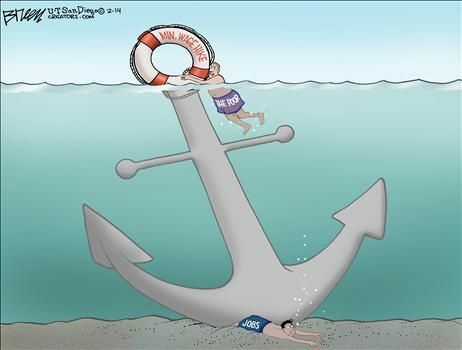 Here are a couple of good cartoons on the topic, beginning with a clever contribution from Lisa Benson. 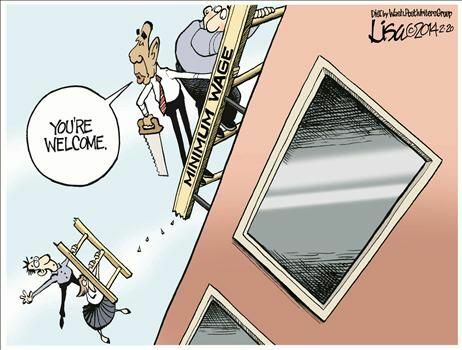 This Steve Breen cartoon makes the same point, showing how the poor are disadvantaged. I also would recommend this video if you want to learn more about the minimum wage, and if you want to understand why this issue gets me very frustrated, check out this interview. It’s especially perverse that politicians are pushing these policies when, as Walter Williams has explained, blacks and other minorities are among the biggest victims. Last but not least, I’m a libertarian, which means that I’m motivated by morality as well as economic efficiency. So I get equally upset that politicians think they should have the right to block a labor contract between consenting adults. What gives them the right to tell other people that they can’t engage in non-coercive, non-violent exchange? Minimum wage is a barrier to full time employment. The central theme and overall trajectory of the American voter-lemming herd remains the same: Labor participation (i.e. people’s motivation to work and produce, i.e. national competitiveness) is dropping and the general plan of the voter-lemming majority is to address the problem by further flattening the effort-reward curve. We are in the pivotal phase of a textbook irreversible scenario to decline. So, losing competitiveness in the world? Increase the minimum wage, more pay for the same amount and quality of work, and also hand out other massive freebies to incentivize people to work less. Can you see why the tipping point has passed? Lack of competitiveness has come full circle and the voter-lemmings are now experiencing the predictable lowering of their standard of living. They are stressing out, so they are now flocking to the polls to recapture the losses by increasing the minimum wage. The vicious cycle has closed. An avalanche of self-destructive cycles has been unleashed. So there is already a two percent labor participation reduction baked into the ObamaCare cake — which BTW will turn out to be much higher, just like the cost and overall demotivation to work impact — and we are proceeding with further plans to reduce demand for labor. Apparently, most Americans think they have plenty of advantage margin left compared to the next group of most competitive nations in the world. They calculate that they can afford to spend some of that margin to flatten the domestic effort-reward curve a bit more, and make life a little easier for Americans, while keeping the American population in the top ten percent of worldwide prosperity. In reality, not only there is no margin left, but the critical point has passed and we are now living the few short years of momentum. Momentum accumulated from the past, as well as small international perks that once harder working Americans accumulated, like the fact that the dollar established itself as the most credible currency to be used in international trade. These small perks are now being cashed in and destroyed by printing money. These perks, as well as the shot lived momentum will soon run out. What will then voter-lemmimgs do? Regurgitate overnight ten years of HopNChange in order to return to competitiveness? You look at the trajectory and the vicious cycle unfolding and make a decision for yourself. Those who do not prepare for America’s decline will be in for a very tough ride. Changes in the minimum wage do next to nothing. Wealth and liquidity are not the same thing. Raising the minimum wage only increases the liquidity of the perceived value of an hour’s work. Workers are not getting paid for an extra 20-25 minutes worth of work, rather the value of their hour is being divided into 1010 individual units of liquidity rather than 725 units. The people this will hurt the most are individuals whose hour is valued between 1010 and 726 units of liquidity, since their additional ‘worth’ beyond that base hour is erased. All that would happen if the minimum wage were raised to $100 per hour is we’d essentially see pricing like in Japans and would likely drop decimal places in payment and prices. We might have a $10 menu. Until the minimum wage becomes $725, and things would look like they do today, just with the decimal place moved. There are studies out showing how most businesses don’t object to a higher minimum wage. However, those businesses probably don’t have many minimum wage employees. Companies that do most likely cater to low income clients. Raising the minimum wage will raise cost and prices, if they can continue to operate. If they can stay open, service will probably suffer. The poor will suffer from a trifecta of higher unemployment, higher costs, and reduced service. Karl Marx explained 150 years ago that businesses have huge power and vast resources, and that wages are progressively driven down until there is both too much production and those wages are too low to buy anything. The Marxist view is that we are all doomed to starve amid piles of plenty, unless the Revolution of Government can save us (change we can believe in). Team Obama is merely applying this Marxist truth. All respected economists agree, really. Only kooks and the running-dog servants of the imperialists believe anything different, just as they deny climate change. For those who mistrust Marx, there is Keynesianism (Marx-lite) which even power-hungry Republicans can recommend. Simply put, everything will be OK if the government collects more taxes (now or later) to buy things now, benefiting the working man and buying down those large piles of overproduced goods, such as cheap large-screen TVs. Really, this is all a version of Bonnie and Clyde’ism. Everybody loves it when B&C are spending their loot and leaving big tips. You merely have to ignore those brief instances where they are stealing the wealth from the banks, from people who we shall ignore, and hope that they are all fat cats who deserve to be stolen from. Thank Gaia that we have men in government, led by the non-ideological Obama, who can apply these time honored(*) principles of social justice and economics to bring us the prosperity of Russia, Greece, Spain, France, Cuba, and Venezuela, and make Marx proud again. (*) Marx’s theories haven’t worked out so well, so far, but do not despair. This time, with better politicians and much more wealth to start with, we are going to do better, and keep trying until we get it right. I think many liberals simply do not understand the concept that raising the minimum wage will kill jobs. They think it is a Republican talking point designed to protect the wealthy. Better illustrations of why jobs get lost are necessary. For instance, with the increase from $7.25 to $10.10, a business owner with 10 full-time minimum wage employees, would face an annual total wage increase of $57,000. For many such business owners, that amount could represent his/her entire bottom line. Government has a three-step program to help American taxpayers! 3. Kiss your azz goodbye.